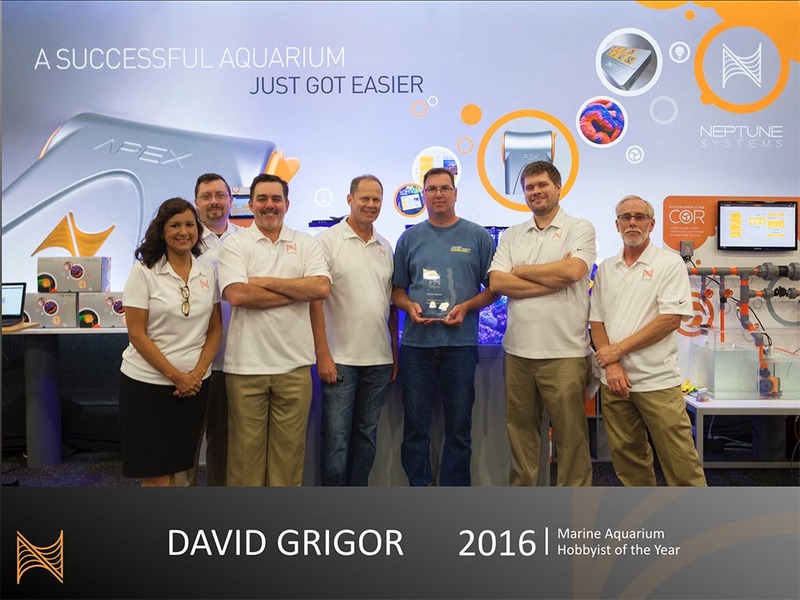 Last year, Neptune Systems named David Grigor the Marine Aquarium Hobbyist of the Year (MAHY). There were many worthy applicants, but just like prior-year winner Brad Syphus, David came out on top when it came to his: love of the hobby, dedication, persistence, patience, helpfulness, humility, and incredible respect from his peers. From the tears in his eyes as he gave a short speech, to the incredible reception given to him by the audience, it was clear that the right choice had been made. Now the next MAHY must be found. So with this press release, Neptune Systems opens up the application process for the 2017 MAHY to all marine aquarium clubs and organizations across North America. Prepare your nominations and get them to us by 8/1/2017 to be considered for this award. In addition to the great honor of being in the company of a hobbyists like Brad Syphus and David Grigor, the recipient of the MAHY award will be provided with airfare to New Orleans, hotel accommodations, and a full ticket to MACNA. Additionally, they will receive $500 in new gear of their choice from Neptune Systems. Must belong to a club, for at least one year, that is a current member of MASNA. Nominations can only be made by a MASNA-member marine aquarium club. An individual aquarium club may only nominate one member for this award – chosen in any manner they desire. Nominations must be sent to mahy@neptunesystems.com by midnight on 8/1/2017 to be considered for this award. Nominations must be submitted by a club official with examples (links to online profiles, forum posts, photos, etc.) that would show how this person exemplifies the following criteria: love of the hobby, dedication, persistence, patience, helpfulness, humility, and incredible respect from his peers, along with a few paragraphs stating why the club feels this person is deserved of the award. The nominee should be an “everyday” hobbyist (as opposed to a known personality in the industry). These individuals will work with Neptune Systems to come to consensus on who they believe is most deserved of the award based on the criteria above. Selection will be made by 8/10/2017 and the winner will be notified privately so arrangements can be made. Announcement of the MAHY winner and the presentation of the award will take place at the 4th annual Neptune Systems 2017 MACNA Meetup on Friday morning, August 26th, 2017 in New Orleans, LA. 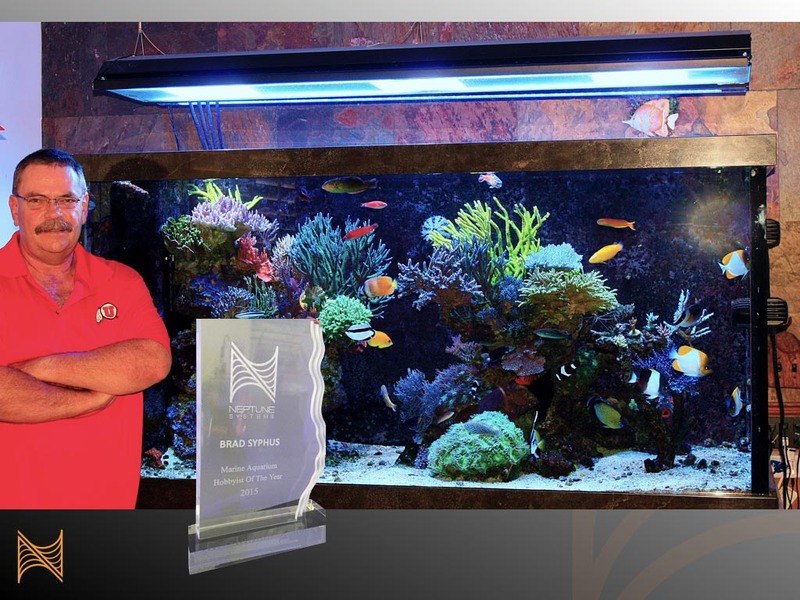 Brad Syphus, the first Neptune Systems Marine Aquarium Hobbyist of the Year, recognized with the honor in 2015.